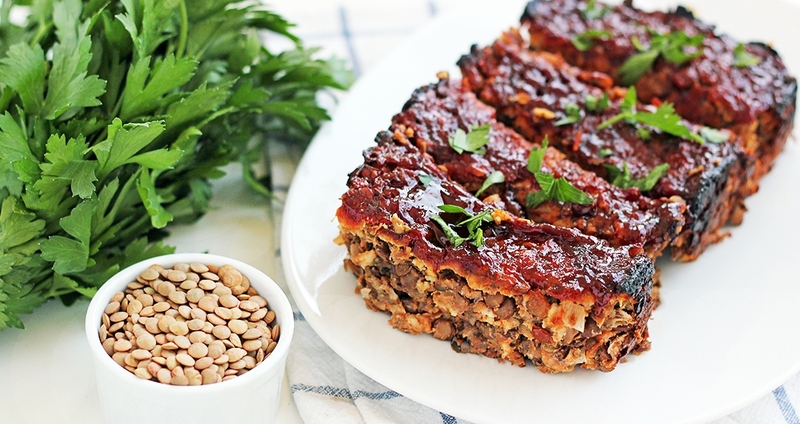 This lentil loaf is perfect for busy weeknights when you’re craving something hearty and healthy. It’s loaded with plant-based protein, and is a wonderful vegetarian entrée that will satisfy carnivores as well. To save time, the lentils can be cooked in advance and refrigerated, or you can substitute one 15-ounce can of (cooked) lentils. Mix the flax meal with ¼ cup water in a small bowl. Set aside. Bring 2 cups of water to a boil in a medium pot. Add the lentils and simmer for 25–30 minutes, until lentils are tender. Drain any excess water and partially mash lentils. Scrape into a large mixing bowl. Stir the onion and oats into the lentils until mixed. Add the flax mixture, tomato sauce, garlic powder, basil, parsley, salt and pepper. Mix well. Grease a loaf pan with the coconut oil, then spoon in the lentil mixture. Smooth the top with the back of a spoon, and then top with the BBQ sauce. Bake at 350 degrees F. for 45 minutes, or until the edges of the loaf are dry and firm. Let cool in pan for about 10 minutes. Run a sharp knife around the edges of pan, then turn out onto a serving platter. Top with additional BBQ sauce if desired.